Come springtime hot porridge can be seem a bit like a winter chore. For variety if nothing else you should try this recipe. 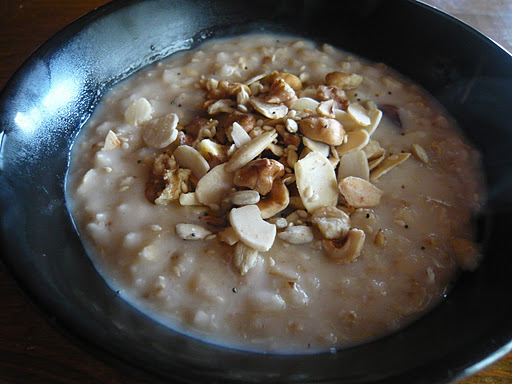 It is lighter and has a different texture and taste to porridge. It retains the same nutritional impact possibly gaining something from not cooking. In the photo I have combined the oats with the compote and toasted nuts. It will work with bananas or any fruit. Toasted nuts and seeds, always. You can use any kind of oat for this recipe apart from the fine oats such as Quaker which are a bit powdery. 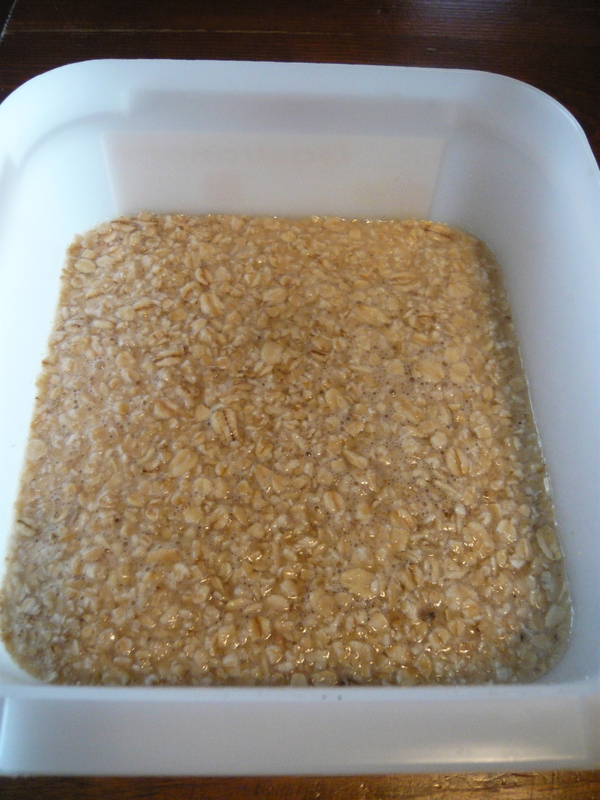 The consistency of the soaked oats is optimal with medium sized oats. The quantities given for this recipe is for 2 people for one breakfast. It doesn’t really keep that well so be exact with the measurements. Place the oats into a tupperware container or glass bowl with a lid or just wrap with cling film. Cover with the apple juice. The oats need to completely covered but not swimming in the juice. Put into the fridge for a minimum of 3 hours. Overnight works better so you can have them for breakfast that day. 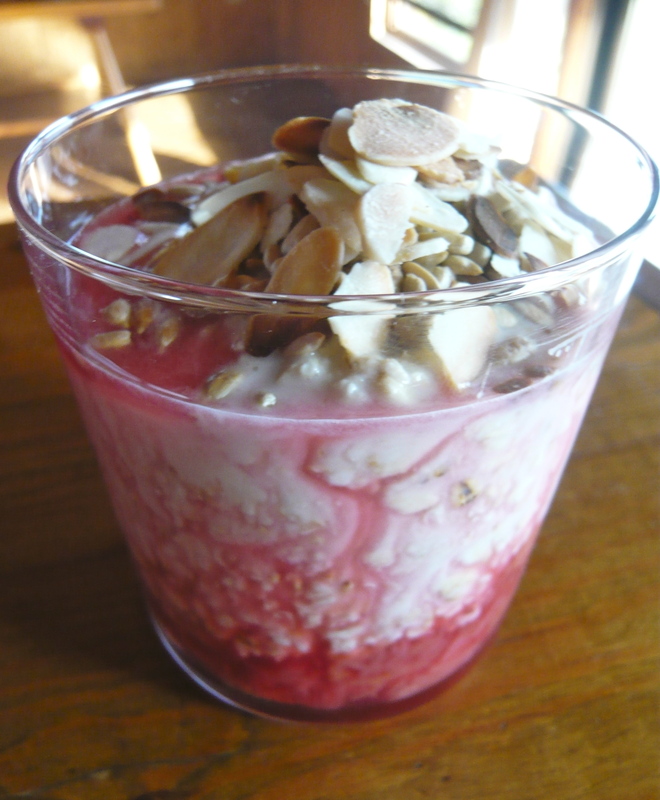 Take two individual glasses and spoon in some of the fruit compote and then spoon in the soaked oats. 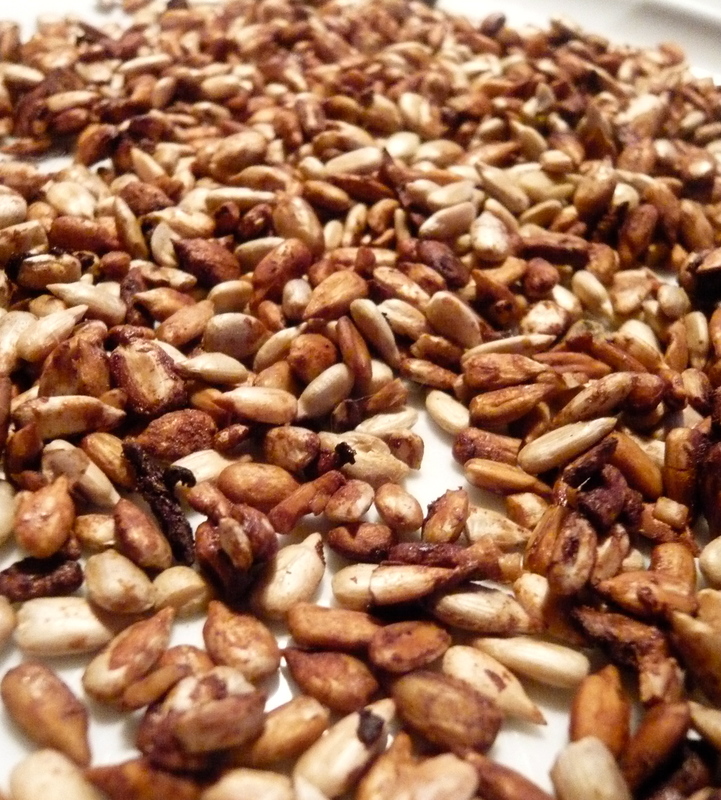 Sprinkle with toasted nuts and seeds. I can’t get enough of these. Always make more than you need as they are hard to stop eating. They keep well in a tupperware making a great addition to green salads and vegetables. When you make them the smell should remind you of twiglets. Heat a large frying pan and add the seeds. Dry roast them until they are nice golden colour, remove from the heat and splash over the tamari. You will need to keep the seeds moving (use a silicone spatula for example). 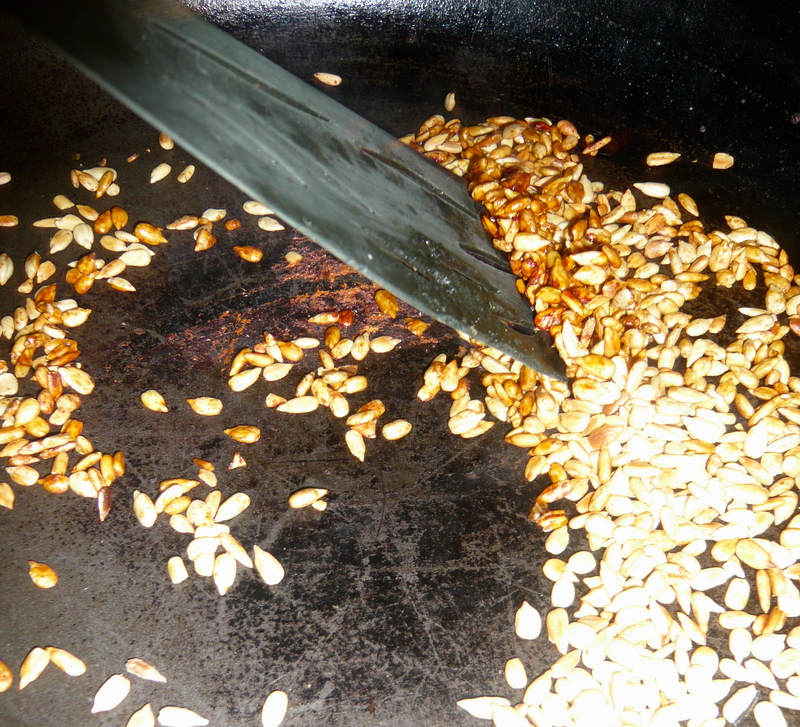 Once the seeds are evenly coated, put onto a plate and leave to cool. I devised it originally to use up the chicken leftovers from a roast. You can just as easily griddle a chicken breast. I use a lot of quinoa in my cooking. Its a complete protein, a carbohydrate and it’s gluten free. Like oats it has complex carbohydrates and essential amino acids which makes it good for training. Most importantly it’s versatile and works as a sweet or savoury dish. To make the yoghurt sauce mix together the lemon juice, salt and pepper. Peel and de-seed the cucumber and cut into small squares, chop the mint and add to the yoghurt and mix together. Cut the cherry tomatoes in half and put onto a baking tray covered with baking paper. Sprinkle with plenty of salt and black pepper and some olive oil. (Optional, drizzle a small amount of honey, agave, maple syrup or just a bit of sugar over the tomatoes for added sweetness). Pour the quinoa into boiling water for 8-10 minutes, taste, it needs to be soft but with a bit of bite. Drain into a fine sieve and refresh under the cold tap. Let it drain for 5 minutes then lay out flat on a tray and cover with kitchen roll and press the excess water out of it. Roughly chop the capers and finely chop the spring onion and the parsley. Combine the above ingredients in a bowl. Squeeze half the orange and half the lemon into the ingredients. Season with salt and pepper. Turn the ingredients over to combine gently. You don’t want to break up the tomatoes too much. 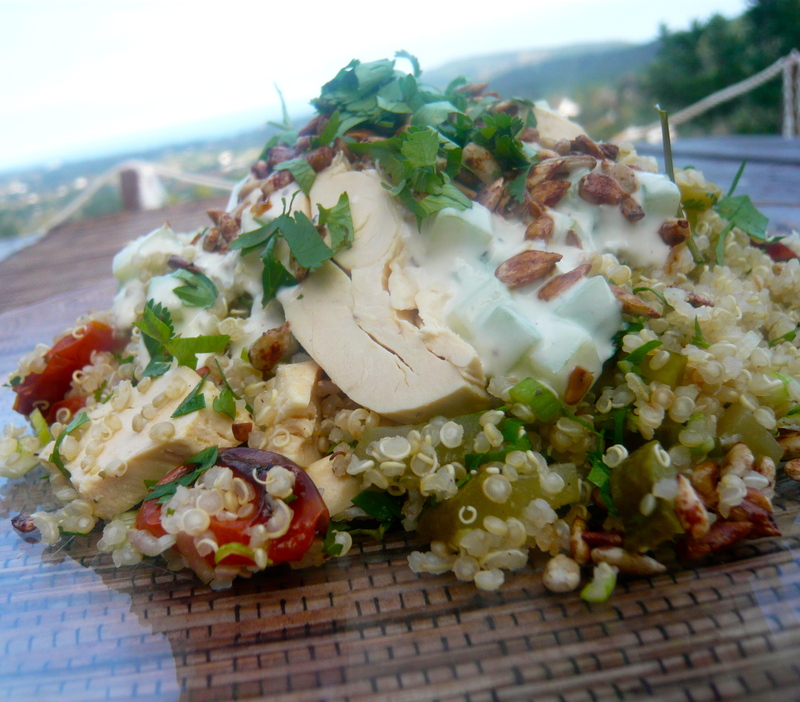 To serve, place the quinoa mix on a plate and layer on the chicken, pour on the dressing and garnish with herbs and seeds. Porridge can give a warming start to a winter day. Oats in general do this, although you will find soaked oats work better in the summer. 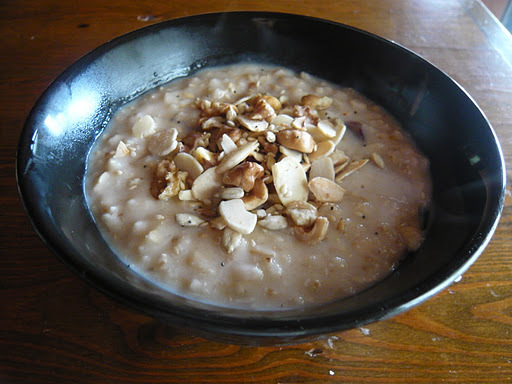 It is generally agreed that whether you are in training or just trying to make it through to lunch, porridge is a good healthy food to start the day, the only drawback I can find from a health perspective, is that is is not gluten free (I will be including gluten free porridge recipes). Simply put, oats are a ‘good’ carbohydrate which means they are easily and slowly digested and stabilize blood-sugar levels. This is my sugar and dairy free recipe. I use watered down apple juice to cook out the oats and almond milk to finish. If you don’t have almond milk, soya or any alternative milk will do. You can also have it with apple juice alone. Keep the porridge wet by adding more liquid. You don’t want the end product to be thick and lumpy, better to aim for smooth and velvety. See fruit compote for another level to this recipe. 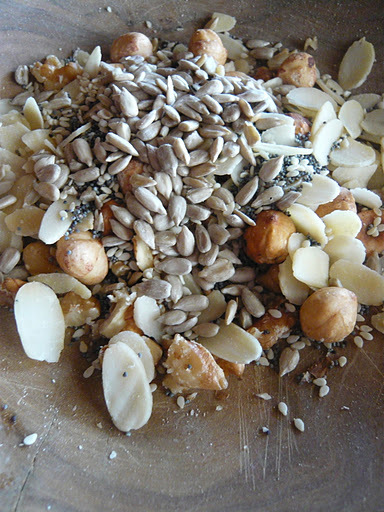 60g mixed nuts and seeds (e.g flaked almonds, hazelnuts, pumpkin seeds, sunflower seeds, poppy seeds). The small mixed bags they sell in supermarkets would be perfect. Weigh your oats and put them into a heavy bottomed saucepan (weighing the oats ensures that you don’t get waste and you can monitor your intake).Add the dried fruit if you’re using them. Cover oats (and fruit) with the apple juice and water and mix. In a separate small non-stick frying pan toast off the nuts and seeds. When they are done take out of the frying pan and put onto a plate or they will continue to cook. Start cooking the porridge on a medium heat. Try not to leave the pot unattended as it tends to burn really easily, this will take between 5 and 7 minutes. When the oats are creamy and cooked stir in the almond milk until you have a smooth consistency. Serve in a bowl with the chopped nuts and seeds sprinkled over.